It’s been an interesting year for Bloomberg Sports. They introduced themselves in a big way to the world of sports after announcing partnerships with both MLB Advanced Media and NFL.com, and are out to prove they can revolutionize the way both fans and professionals consume statistics–just as they did when they introduced the “terminal” to the world of financial services. In one short year, Bloomberg Sports has already been named one of the top 10 most innovative companies in sports by Fast Company and seem to be well on their way to playing in the big leagues. 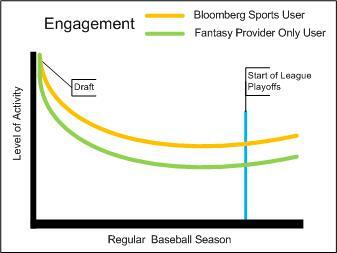 With over 10 million fantasy baseball players all fighting for bragging rights, enter Bloomberg Sports – Front Office 2011. Totally redesigned for this season, Bloomberg partnered with Roundarch to design and develop a suite of tools that gives fantasy baseball players an edge on their competition through a multi-channel digital experience. With Bloomberg’s statistical algorithms and an easy to use yet powerful interface for the web, iPhone and iPad, fantasy managers are able to lead their teams to the championship from draft day straight through October. A key feature implemented in this year’s version is the ability to sync Front Office 2011 directly with each of the 3 major fantasy providers (ESPN, Yahoo, and CBSSports.com). Once synced, fantasy team managers can see news, lineup recommendations and player rankings that are fully customized to their team. To date there are more than r 25,000 unique league settings synced with Front Office 2011, which means an equal number of different player rankings. With this type of customized analysis, draft preparation has taken on a whole new meaning. Traditionally, fantasy users are most engaged at the beginning of the season with post draft day user engagement falling precipitously. For many, the adage is that the fantasy season is won or lost on draft day. We believe that doesn’t have to be the case when a season is 6 months long and a host of moves can win – or lose – that league championship between April and October. To capitalize on this, Front Office 2011 aims to not only change the way fantasy players prepare for their drafts, but to also create a market for a companion tool set that users rely on throughout the duration of the 162-game season. Through fantasy user research Roundarch has found a significant correlation between league standings and overall engagement level. Analyzing league activity over the course of a season has shown that as teams fall lower in the league standings, users essentially stop playing. This reaction is sped up by a fantasy manager’s failed attempts to improve team performance. At the other end of the spectrum, managers of teams performing well will stay engaged, and actually show an increase in activity as the playoffs approach. One logical way to keep users engaged all season long is to keep them more informed and competitive throughout the season by making information easy to understand and utilize to their benefit. Once a fantasy league has drafted and the baseball season is under way, there are two management areas that impact a team’s performance.
. The challenges in fantasy baseball are the frequency of the games, the uncertainty surrounding an MLB player’s availability to play and the amount of time a fantasy manager needs to focus on their lineup to ensure they are making good decisions. This is compounded by the need to make decisions daily, rather than weekly. For a fantasy manager this can be quite a time consuming process, especially if the user conducts his or her own research and player evaluation. To help combat this time consuming process, Roundarch designed Lineup Manager Tool to help the user answer all those questions quickly, easily, and with confidence. Lineup Manager algorithms analyze the user’s roster based on the season to date by calculating daily projected performance to derive the best starting lineup for each day’s games. The Lineup Manager tool then displays easy to follow recommendations to Start, Bench, or Swap players in and out of the user’s lineup. Each recommendation highlights the affected players, explains the reason for the move, and the statistical impact allowing the fantasy manager to be confident that every decision made is well researched. Both transactions require the user to select departing and incoming players. Many users feel that like the draft, dropping and adding a player is a do or die moment in their quest for the title. From the fantasy players we have interviewed, we understand that there is a tremendous fear of dropping the wrong player, dropping a player ahead of measurable improvement, or adding the wrong player. The Free Agent Finder was designed to help the user in each of these areas. An area that goes largely untapped by a majority of fantasy users is trading between teams. Roundarch has learned that users shy away from this strategy largely because they are unable to confidently evaluate trade offers. Trades that are accepted generally consist of players that are similar and ultimately do not improve either team, or worse, a user may accept a trade that is unfair and weakens their team. Once a user has been burned by a bad trade, the typical response is to reject every trade offer and utilize the free agent pool exclusively. Trades in fantasy baseball, just like in the majors, should be exciting opportunities to get players that will make an impact and help their teams. Roundarch saw this as an opportunity for fantasy users to engage in every aspect of the game, and consequently created the Trade Analyzer tool which allows users to easily view recommended trade ideas or evaluate any trade based on fairness and statistical impact. Trade Analyzer, like Free Agent Finder, will recommend trade ideas that will help the user’s team in underperforming areas. These trade ideas are based on past and projected performance as well as league standings. All trade ideas displayed are beneficial and balanced for the user and their trade partner. The Balance calculation looks at each player’s ranking and the value of the player to each team’s roster. A balanced trade involves players who are similarly ranked but are not necessarily similar players. A warning is displayed when an unbalanced trade is evaluated and the Trade Analyzer cautions the user against making the trade. 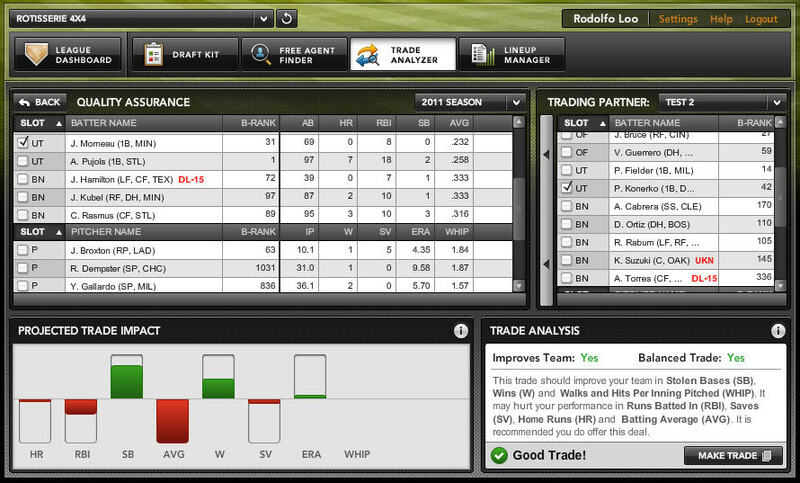 Statistically, both teams improve from the trade idea, but each trade idea is customized to the user’s team needs. Beyond the recommended trade ideas, users may enter any combination of players from their roster with any other team in their league to evaluate the balance and statistical impact of trade offers. With these tools, users can now evaluate and offer trades knowing that they will improve their team. 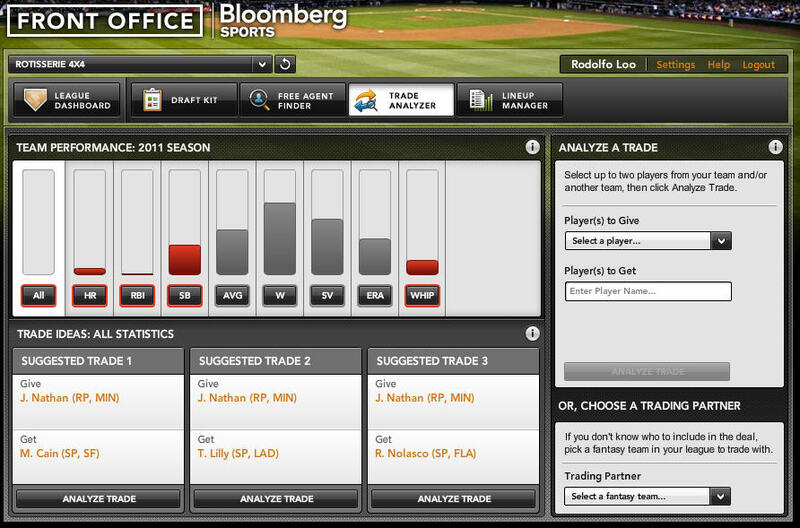 Bloomberg Front Office 2011 featuring the new Lineup Manager, Free Agent Finder and Trade Analyzer tools helps to keep fantasy managers informed, competitive, and most importantly engaged through all 162 games of the baseball season, giving everyone a shot at fantasy baseball championships with just a few clicks.